Last week was a cold one. If I remember correctly, there was a wind and thunderstorm advisory/warning for the area…and let me tell you, it felt like winter was coming. Many of the vendors had packed up and left by the time I arrived to pick up my half-share. 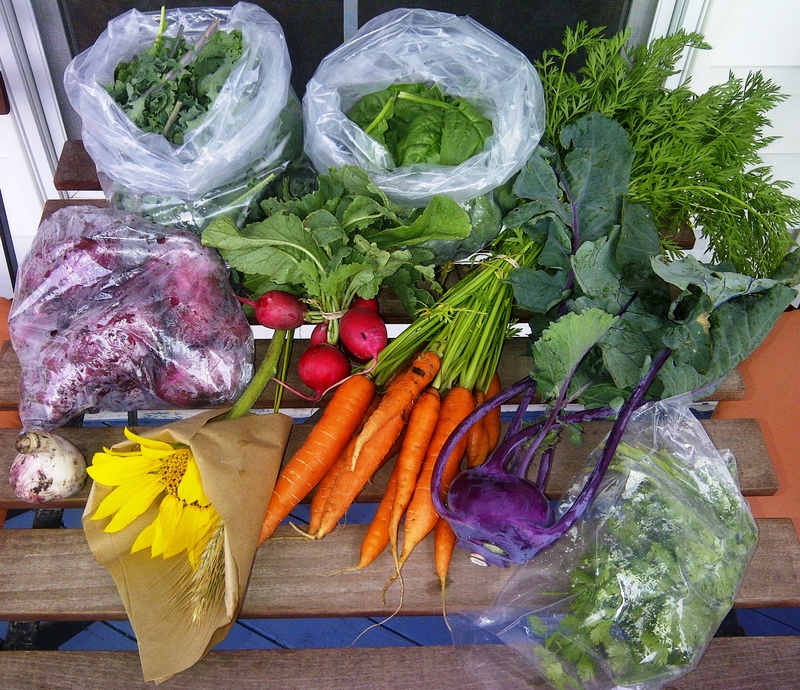 We received Kale, Red Potatoes (they are red all the way through), a bulb of fresh garlic, radishes, carrots, kohlrabi, cilantro, spinach and a glorious sunflower. I can almost smell the freshness 🙂 Come and link up to this week’s CSA Link party when you get a chance…http://inherchucks.com/2012/08/15/whats-in-the-box-39/. Looking forward to seeing you there! Mmmm those carrots look bigger than last week’s. Try roasting the kohlrabi along with the potatoes, carrots and garlic. Generally I do not read post on blogs, but I would like to say that this write-up very forced me to try and do it! Your writing taste has been amazed me. Thanks, very great article.